Posted on Counterpunch on January 24, 2018. One of the largest social and political uprisings since the 1979 revolution in Iran has died down for now. 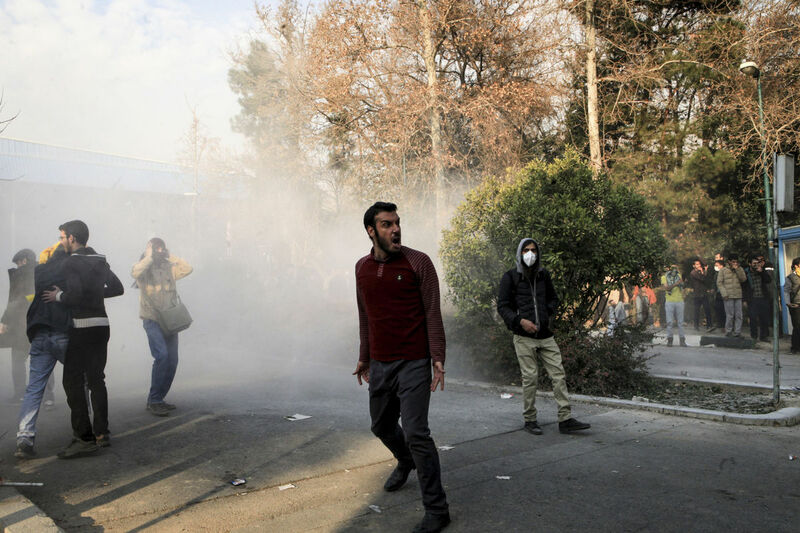 However, due to the very lasting structures which ignited the first round of the protests, in more than 75 cites all around Iran, it does not seem to wane. One can argue that it is only the beginning of an end – the prolonged end of what we know as the Islamic Republic, either by an uprising or by an implosion. Some noted the structural causes and political-economic effects of the recent protest perfectly, among them these two are well-articulated: ‘The Moral Economy of the Iranian Protests,’ ‘Causes behind Iran’s protests: A preliminary account.’ It is now worth noting their reception in the mass media and the concerted efforts to manipulate its true origin. What we are witnessing now is a gridlocked systemic and systematic crisis. Systemic, for the whole system, in contrast to a particular part of it, suffers from a widespread endemic corruption that functions as a kernel in which the four-decades of socio-economic and political grievances are visible. Systematic, for the structural defects and problems cannot be solved or even fixed by minor modifications that serve only to defer any real transformation. It also means the whole system, including the so-called reformists and the conservatives, are responsible for the present predicament. To name but a few symptoms of the current crisis one could mention the stagflation, unfettered privatization, structural adjustment, deregulation, unemployment, ‘airpocalypse’, and all those policies having been imposed after the long Iran-Iraq war (1980-1988), the policies which could be articulated as the Iranian ‘accumulation by dispossession’ – a Master-Signifier to diverse signified. It is indubitable that the economic grievances are the first and foremost drive for the recent protests. Indeed, the country’s economy seemed to be spinning out of control. Yet the economic, unlike the highly capitalist societies, has been inexorably tied to the political in the global south, as it was the case with the Greek crisis in 2015. The ‘elective affinity’ of capitalism in the so-called periphery societies provided the left with an opportunity to reject both the authoritarian governance and capitalism as a normative dispositif, and Iran is no exception in this regard, if not the exemplar of it par excellence. Almost all the problematics of the Islamic Republic is a distorted form of what we have seen on the global scene with simultaneous eccentric peculiarities that are coupled with a theocratic rule now in power. Ironically it seems, the government born out of 79 revolution started to constitute itself exactly at the beginning of Thatcherism and Reaganism. The long-life of the IR, thus, corresponds to the four-decades of neoliberal agenda. The enigma of Islamic Republic surviving four decades stems from the fact that, though isolated it has succeeded in finding itself amongst the global free-market as an exporter of raw materials and importer of goods and services. While being included in the system of globalized capital, owing to its oil reserves, it has been excluded from its presumed benefits. This exclusive inclusion, the ambivalent international status of the IR in relation to the forces of capital, led the commentators to hasty observations of how to understand its nature. It is from this perspective that one can see the kind of establishment which people are protesting against. The Islamic Republic is by no means a democracy even in the formal sense, rather a hybrid form of theocracy and plutocratic oligarchy with heavily-controlled elections. At the level of democratic procedures, it follows, frantically, the rules of the alleged democracy in the 21st century, with nearly one election biennially. Though rigged and opaque with strict filtration of the candidates, it observes the electoral game to its logical end, to the extent in which it has turned to a ritual in Iran with all its pre-post implications. This ritual involves a limited spurious choice ‘between the lesser of two evils’ – the reformists vis-à-vis the hardliners, in this case – giving the voter some sense of agency while preventing them from fulfilling their very agency. The point is how a theocratic Constitution along with an oligarchic ruling class dominated this formal democracy. Though radical democracy means going beyond parliamentarianism, not to mention the leftist criticism of democracy, both the term and its practice in the modern world, there is no democratic order proper in the conventional sense in the IR. It is a peculiar form of demo-theo-pluto-cracy which cannot be considered by its voter turnout – a rampant misunderstanding in the western media persuaded by pro-regime pundits in the US and Europe. In the aftermath of the wave of protests in Iran, the mass media in the Anglophone world has failed, intentionally or unwittingly, to depict it rightly. The mechanism in which the for-profit media tried to manipulate what happened in the streets of tens of cities all around the country, during ten days for the time being, consisted of two mega-categories. The first, to call into question the originality of the protests in Iran, the modus operandi operated by the mainstream media such as BBC, Aljazeera English, and others. The second, to repudiate their independent act of uprising by invoking to Trump’s unconditional support of Iran protests, in unfortunately alternative and liberal media such as Democracy Now and the Guardian. To begin with, there is a semantic zero level of misreading any uprising in the mass media by calling it ‘unrest’, something which renders the order, constituted and preserved by the police, disorder. The sacred space of sovereignty predicated upon an order, an authoritative command, to keep the order, the arrangement of bodies and actions, in an appropriate way. Any political movement or uprising would consider in their eyes as a threat to order, in both senses of the term, thereby label it as ‘unrest’ which would cause disorder rather than reordering the very order of the things. Politically speaking, the mainstream media in the Anglophone world, replete with the IR spin-doctors, engaged in three levels of misrepresentation. Initially, they tried to ignore it as the hardliner underplot to topple the reformist administration down, as if there were any different attitudes towards the underprivileged between the two factions of the IR. The next step, following the unsuccessful ascription to the conservative camp, was to underestimate the number of protesters thereby humiliate the participants as a few poor, uneducated lumpen-proletariat, with no aim at their disposal, sabotaging the public property, banks, garbage bins, etc., who have no notion of non-violent struggles. Their ode to the maturity of middle-class in being an observer during the wave of protests is to be understood in this respect. When it spread to tens of cites across the country, however, another distinction was made visible in their rhetoric between those who have the right to protest moderately, and those who have embarked on taking down the police stations and clerical offices – Again as if the violence began by people who have nothing in their hands rather than the armored anti-riot police. To take but a few examples of different levels of misrepresentation, one of the earliest Tweets by the Iranian contributor to Al-Manitor on the third day of the uprisings indicated that just a handful of people protested in the streets while there were 40 million voters participated in the last election. Another Iranian-American journalist and a frequent commentator on Iran at BBC, New York Times, Aljazeera, Huffington Post and others, tweeted on the fourth day of the uprisings that the protesters are much smaller than 2009 so that she “can’t find anyone personally who has joined the protests.” She later modified her Tweet, by justifying her stance that the demography of the protests seems different. Surprisingly enough, the alternative news outlets do not fare much better. Their hysteric obsession not to be identified with Trump or the neocons in the United States makes them revolve around every tiny word he would say in order to riposte immediately. The result of this over-reaction is nothing but ignoring those people struggling against the same politics that put Trump and alt-rights into power, not only in the US and Europe but also in the global south. One of the most amazing examples in this regards is Democracy Now anchored by Amy Goodman and Juan González that is supposed to give voice to the heterodox journalists and analysts in contrast to mainstream media. In a broadcast released on the sixth day of demonstrations, Democracy Now invited a CNN correspondent in Iran who was just back to Los Angeles for holiday to declare the government restraint toward protesters and the president reception of the people’s right to protest, as well as the founder and president of the notorious National Iranian American Council (NIAK) to declare that “Trump messages carries no credibility.” The over-weight of Trump criticism in the alternative media is central to misrepresenting any social and political movements in the years to come. Moreover, to avoid Trump taking the power is to fight with him domestically as well as internationally, strengthening the grassroots movements that are fighting the manufacturing of ProducTrump. The discursive struggle seems an indispensable part of any political movement to endure the cultural and material repression. The international leftists have a work to do in solidarity with the less-heard isolated forces in the media. As Rosa Luxemburg once said, ‘the most revolutionary thing one can do is always to proclaim loudly what is happening.’ It is the task of producing counter-narrative by alternative media not to let the far-right politicians appropriate the genuine uprisings against neoliberal authoritarianism merged with theocratic plutocracy. Another Iran is not possible but necessary.